B.Tech Civil Engineering students from FOE proposed “Smart Villages” development plan in their final year project. B.Tech Civil Engineering students from FOE proposed “Smart Villages” development plan in their final year project. According to it, the focus was placed on awareness campaign, efficient management of water supply, sewage and waste management of RAMA and NAI villages near Udaipur. The efforts put by group of students in completion of this project were appreciated by members of Panchayat Samiti of respective villages. 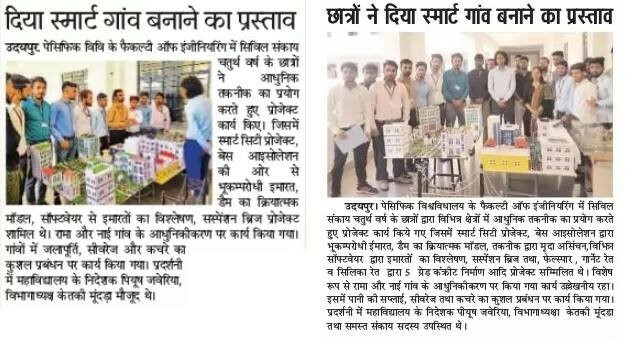 http://www.pacific-it.ac.in/wp-content/uploads/2018/11/B.Tech-Civil-Engineering-students-from-FOE-proposed-Smart-Villages.jpg 348 637 nirbhay http://www.pacific-it.ac.in/wp-content/uploads/2017/06/PIT-black-resize-1-min.png nirbhay2018-11-15 09:01:592018-11-15 09:53:23B.Tech Civil Engineering students from FOE proposed "Smart Villages" development plan in their final year project.